Tuff Flags offers a wide variety of Outdoor Lighting. 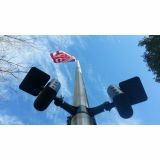 Originating with our commercial grade flagpole lighting and event lighting, we began receiving numerous requests to offer the same quality of lighting in other areas of use beyond flagpoles and event lighting. We offer spot lights, flood lights, and area lights for cities and schools. Most of our lights have very targeted uses. Our focus is on high quality, easy to install and assemble lighting that largely in self contained and can be installed in minutes. All of these products are durable, long-lasting, and carry with them extensive guarantees. 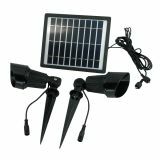 If you have an event such as a downtown festival or a ceremony where quick lighting is needed without costly wiring, than our solar light products are just what you need. For areas or events where wiring is available, we offer a range of wired lights that are easy and safe to install. 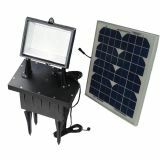 Most will come with a power supply as well as smart technology that turns it on and offer at your command. Tuff Flags Lighting is commercial grade and intended for many years of use. With so many options and technical nuances, please call us and we'll walk you through the most appropriate light for your application. Guaranteed Satisfaction!